Cuba's Havana has been a favoured medical tourism hub in the Americas for nearly half a century, not only for its cheap, high quality health care, but also for its attractive recuperation options. Best known for their cancer treatments, cosmetic and orthopedic surgeries, as well as rehabilitation for drug addicts, Havana hospitals typically offer savings of up to 80 percent against US prices. Football star Maradona famously spent a number of years here undergoing drug rehabilitation. Locals have access to free mediocre medical care in government hospitals, while medical tourists in Havana have a choice of nine hospitals focusing on foreigners. The hospitals in Cuba do not boast JCI accreditation, yet Havana doctors have a reputation for quality care, with Cuba having the globe's highest doctor-to-patient ratio. There are nine major hospitals in the city, as well as a number of clinics, with the city's primary hospital for medical tourism being the Havana Hospital, featured in Michael Moore's blockbuster Sicko. Here a wide range of cardiac surgeries and hip and knee replacements are offered, while the Cira Garcia clinic is famous for its cosmetic surgery. While travel to Cuba is straightforward for citizens of most countries, US nationals must seek prior US government approval or travel via a second country, such as Canada, the Dominican Republic or Mexico. Despite this, many US patients continue to seek cheap health care in Havana. Regardless of the absence of JCI accreditation among Havana hospitals, doctors in the private hospitals have access to state-of-the-art equipment. Most Cuban medical professionals speak both English and Spanish, making communication easy. The main draw to health packages in Havana, aside from their attractive prices, is the alluring recuperation options. Not only does the city itself boast an amazing array of UNESCO-protected historical buildings, but it also offers quick access to the eastern beaches and a buzzing live music scene. City hospitals offer a wide spectrum of medical procedures, with cancer treatment using the 'escozul' method (a therapy using scorpion venom). Cosmetic surgery, such as breast enlargement and liposuction, are among the most popular with medical tourists. Knee and hip replacements in Havana are very affordable, as are programmes for drug rehabilitation. The Frank Pais International Orthopedic Science Complex is best known for knee and hip replacements and was the region's first medical facility to carry out such operations. 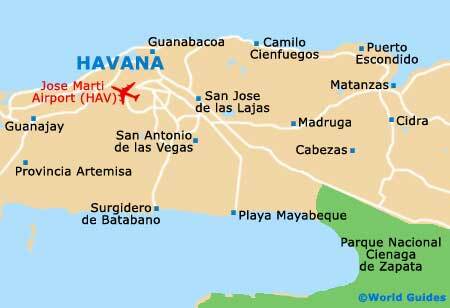 The Havana Hospital is regarded as the city's leading medical facility, offering world class cheap medical care. Here, medical tourists can undergo everything from open-heart surgery to breast augmentation and artificial disc replacement.